Regarding home furniture, your statement might well be, “Why change perfection?” If you thrill at the intricacy of fine woodwork and the rich colors of dark finishes and supple leather upholstery that you see in Victorian or Edwardian furniture from over a century ago, Furniture Distributors has your affordable interior-design dream come true in Millennium Furniture by Ashley. Here, classic furniture designs meet efficient modern manufacturing and distribution, with quality maintained, to give your home a sumptuous look at a mere fraction of the price you expected. 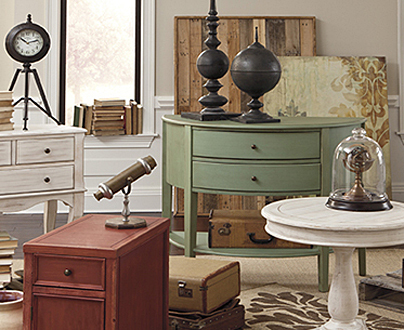 The furniture you love from historical dramas and house tours can now be all yours! Furniture Distributors is proud to offer you stunning Millennium Furniture choices for your bedroom, living room, dining room, and entertainment room. Whether you’re just starting out or starting over in the area after a deployment abroad, we offer the lowest price, every day. 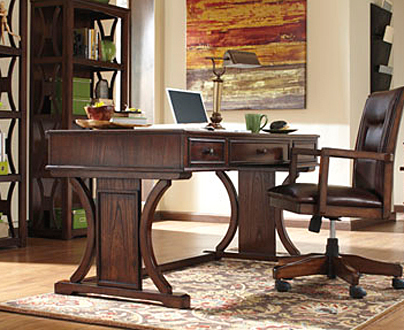 Here are just a few examples of how we will enrich your home decor with Millennium Furniture. 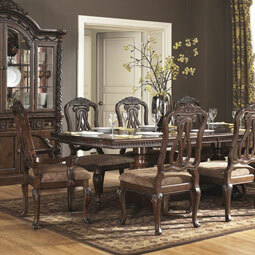 For decorating a living room with gorgeous Victorian-inspired living room furniture, Millennium Furniture is your choice! Take for example Millennium’s excellent North Shore line. Its three-seat living room sofa features grand curves and luxurious top-grain leather, firm and inviting cushioning, three pillows in a lighter complementary color, and classical plumes and medallions on an exposed frame. We also offer a Millennium Furniture loveseat in the same style as well as a beautiful dark leather chaise, classic wood or upholstered armchairs, and a fine faux-leather ottoman from which spills easily wipe off. 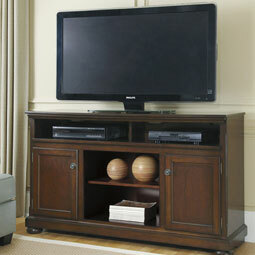 If Theodore Roosevelt had owned a television set, he would have placed it on one of Millennium Furniture’s entertainment room furniture pieces such as the medium or large TV stands in the Porter line, offering a more subdued look but one fitting in perfectly with antiques in a Georgian or Victorian setting. These include adjustable shelving behind the doors for your media needs as well as back panel cutouts for cord management and ventilation. 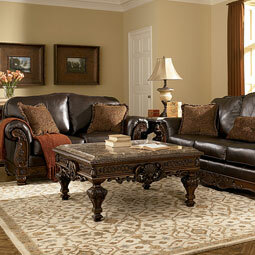 Yes, you CAN afford the luxurious classic furniture you have always desired. Browse the Millennium Furniture offerings on this page, then stop by one of our well stocked discount furniture showrooms including in Havelock, NC. We are proud to serve those who serve, at Cherry Point, Camp Lejeune, and elsewhere.